Kauai has but one main road. 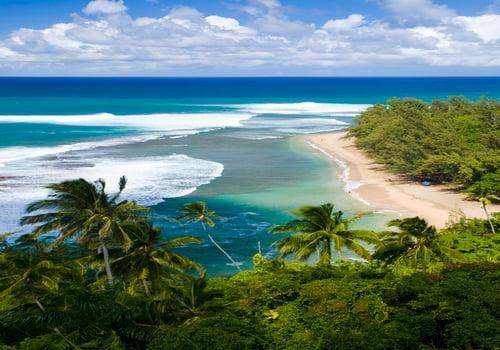 Take it north through Hanalei all the way to the end and you'll be rewarded with Ke'e Beach. And driving there is half the fun. You'll descend a massive switchback that takes you down to Hanalei from Princeville to give you sweeping views of the north shore. You'll then pass verdant fields and little Hanalei town before the road gets windier and even more beautiful. 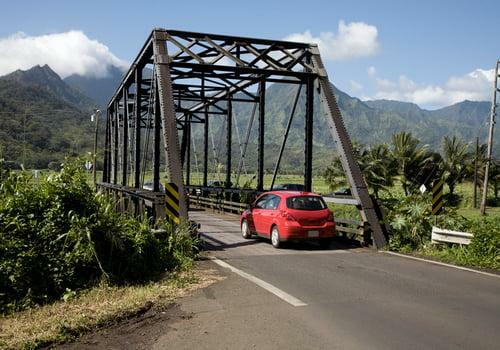 The road hugs the coast leaving Hanalei, and that's where you'll be presented with your first one-lane bridge. The rules are simple -- cross the bridge if nobody is coming. If there's oncoming traffic, slow down, and if you reach the bridge first, slowly cross while the oncoming traffic comes to a stop. It's a local courtesy to allow five cars to cross the bridge before the opposite side gets a go. If it's busy, you simply take turns in each direction; five cars then five cars, and so on. The road is built into a cliffside, so anybody sitting in the passenger-side seats on the outgoing drive shouldn't be afraid of heights. You'll cross over plenty more one-lane bridges as you notice the houses are built on 10-foot stilt foundations. You'll pass plenty of white sand beaches and even a few deep caves. Make sure to stop and take some pictures. There's just one little general store outside of Hanalei, and the rest of the ride is rugged, so pack in your own supplies for the day. And when you finally arrive at Ke'e, you'll feel as if you really have come to the end of all of America's roads. It feels that remote. Ke'e Beach is a popular destination for a variety of reasons. 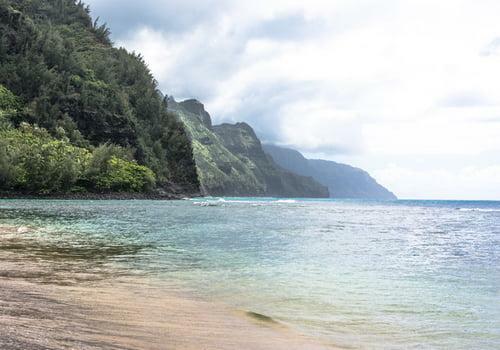 You'll find the Hanakapiai Falls and Kalalau Valley trailhead on the south side of the beach's small parking lot. Tourists pack the parking lot starting early in the morning to tackle the difficult hikes down the Na Pali Coast. There is overflow parking just down the road near the organic farm. It's a dirt lot that is heavily affected by rain, so it may be incredibly bumpy and uneven. Be careful when parking your rental car. It is advised that you do not park on the street connecting the two parking lots. Local police love to dish out parking tickets to tourists on this road, and you won't be able to defend yourself in traffic court as you'll be back on the mainland. You'll be stuck with a hefty fine. Unfortunately, if both parking lots are full, you'll just have to wait for hikers to come pouring off the steep trail and back into their cars. The end of the road is a shaded tunnel of trees. At the end of the tunnel, you'll see a glimpse of blue accented by white sand. You'll also see one small lifeguard stand. And these lifeguards have their work cut out for them as Ke'e is known for its dangerous current, but, if you follow the well-signed instructions, you'll have a wonderful and safe visit. The lush trees of the north side of Kauai seem to walk out into the water at Ke'e Beach. You'll find coconut husks and plenty of mama chickens foraging for food with their chicks. And the first cathedral cliff of the Na Pali Coast towers over the beach on the south side of Ke'e. It makes for a dramatic scene and provides plenty of shade later in the day during the winter months. Speaking of winter, Kauai's west side features seasonally violent surf during the "rainy" season. Make sure to do your homework if you're visiting in wintertime. Visit Ke'e at low tide and when there is no swell on the west side. Fortunately, there's a semi-protected swimming pool up against the Na Pali Coast's cathedral cliff. That's because there's a stout coral reef about 50 yards off the beach. It's perfect for snorkelling when the water is calm and you're guaranteed to see plenty of fish. Just beware of rising tides as the waves can start crashing up and over the reef to grab any unsuspecting snorkelers in the pool. 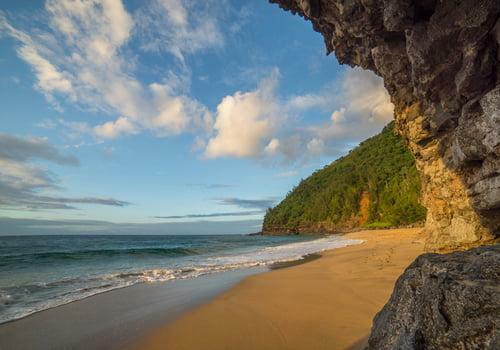 Ke'e is one of Hawaii's most unique beaches and is the perfect place to watch a sunset. You can also choose to hike up the cathedral cliff on the Kalalau trail for less than a mile to get to one of Kauai's most stunning viewpoints. You'll be able to look down the entire length of the Na Pali Coast while looking back down at the tiny dots of people swimming at Ke'e Beach. How will you know you've reached the lookout? You'll know. It's one of the most spectacular views in all of America, and, as an added bonus, locals often sell ice-cold coconuts out of the back of a pickup truck at the trailhead for after you've worked up a thirst.